Getting to and around Georgia’s largest hospital will be easier thanks to Grady Go! Atlanta, Ga. – Grady Health System now offers patients and visitors Grady Go! – a mobile wayfinding platform that provides step-by-step directions to any destination in Grady. 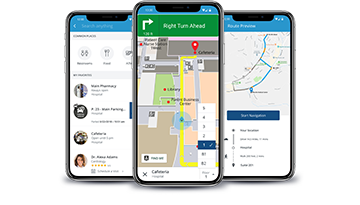 Developed in collaboration with Atlanta-based Gozio Health, the hospital-branded mobile platform provides a GPS-like experience, guiding users from home, to parking, and their in-hospital destination. “Making it easier for our patients and guests to find their way around Grady is an important part of our efforts to enhance our patient experience. The app is an outstanding wayfinding tool that we think will prove invaluable to users,” said Lindsay Caulfield, Grady’s Chief Experience Officer. The patient engagement platform puts all the hospital’s amenities and services at the user’s fingertips, and includes access to medical records via MyChart, the locations of cafes, pharmacies and even the closest restrooms. The app is available for Android and iPhone mobile devices and can be downloaded for free from the App Store or Google Play. “We are excited for the opportunity to partner with Atlanta’s leading Level 1 trauma center and assist families during times of stress with technology that simplifies their visit to the hospital,” says Joshua Titus, CEO and Founder of Gozio Health. Gozio Health transforms indoor navigation and significantly improves patient experience with a smartphone-based, indoor positioning and wayfinding platform specifically designed for hospitals and healthcare systems. Gozio’s pioneering mobile platform dramatically improves mobile adoption rates for hospitals and seamlessly integrates mobile technology into patient engagement strategies. In addition to numerous industry awards, the wayfinding solution from Gozio has earned the exclusive endorsement of the American Hospital Association. For more information, contact Barb Kragor.